Evernote is a tool I use practically every single day. I love the versatility of the system and its cross-platform availability as well as the fact that you can use it for free. One of the features I now take for granted are the variety of ways you can get information into Evernote. Create a new note in a one of the client applications (Mac/PC/Web/mobile device). Send clipboard or selection using keyboard shortcuts. Drag & drop (or send to in Windows) of files into client. From a web browser using a toolbar (button) add on or a bookmarklet. E-mail to a special Evernote e-mail address. Via a script using ENScript. Via a third party system (e.g. ReQall). The more astute may at this point be screaming at me about Twitter and the facility to tag tweets and send them to Evernote. After all this post is supposed to be about Evernote and Twitter. Well compared to the other methods listed above Twitter comes up a little short for me. The fundamental limitation of Twitter is that Tweets have a maximum limit of 140 characters. Now there’s a bit of work involved in associating your Twitter and Evernote accounts and an additional requirement to include the “@myen” mention in in your tweet. This means that once you include a spacer as well you’re going to be down to 134 characters. It doesn’t sound like much of a decrease, but every character counts when you have such a small character limit to begin with. The next limitation for me is that I don’t necessarily want people to know what I’m putting into Evernote. I realise that Twitter is a public communication channel, but I’d rather not publicise that I’m capturing a particular tweet into Evernote as people may read into that. This may seem a little overly paranoid, but I’m sure that everyone can think of a situation where someone read something between the lines that wasn’t there. Lastly and probably most importantly I’m not sure I can always remember to add @myen to tweets when I want to store them in Evernote. So at this point I asked myself why would I want to send information into Evernote by a tweet? I managed to come up with two – but if you think of any others please leave a comment on this post. The first is not one I’ve ever needed myself, but you can send an SMS to Twitter which means that if you don’t have a smart phone but you do have a mobile then you can send yourself a note into Evernote via SMSing to Twitter. The alternative for me with this would be that many cell network providers (certainly in the UK) as well as other third party services allow you to send SMS messages to an e-mail address. You could then SMS directly into Evernote – so there is an alternative. The second reason is one which I find much more relevant and that is to archive my tweets so that I can search through them alongside my other information within Evernote. But if I’m looking at archiving then my hoarding instinct comes out and my approach will be to archive everything I tweet. So when it comes down to Twitter and Evernote I decided that I want to get every single tweet I make into Evernote without having to remember to add @myen to it. In order to do this I need three things. A way to get my tweets out of Twitter in a suitable format for import into Evernote. A way to import my tweets into Evernote. A way to automate the export and import process. The solution is to use Twitter’s RSS feed feature to get the tweets out, the private e-mail address for my Evernote account to receive the tweets and an RSS to e-mail service to automate the whole process. Most RSS to mail services allow daily mailing of RSS feeds and FeedMyInbox is probably the most well known service to do this, currently offering up to five RSS feeds for free. This will give you a daily digest of tweets direct into your default Evernote notebook. FeedMyInbox also offers paid for accounts that allow you to specify when during the day to receive the digest as well as the option to send RSS updates in (almost) real time. So if your willing to part with a little bit of cash then you can get more control. I have tried Xfruits as an alternative to this as it provides a wide range of free RSS related tools and an hourly feed option all for free. Unfortunately the regularity of the hourly feed has been more like twelve-hourly. If you find any other free services with a more frequent cycle do let me know. So once you register for an appropriate RSS to e-mail service it’s just a case of configuring it to use your Twitter account’s RSS feed (available on your Twitter page), your Evernote account’s e-mail address (available in your Evernote client’s account settings or online in your Evernote web settings) and setting the frequency. One thing to bear in mind is that when you register for an RSS to e-mail service then you are likely to receive a confirmation of e-mail address mail … which will arrive in your default Evernote notebook- so remember to check that rather than your regular e-mail mailbox. So that’s all there is to it. 140 characters of information delivered direct to your Evernote account from Twitter at regular intervals with no need to remember to add @myen to your tweets. Evernote is a great application for jotting down a quick note about something new, but occasionally I find that I want to jot a note that’s very similar to an existing note. I predominantly use the Windows 3.1 version and whilst it looks as though copy and paste is enabled for notes it isn’t. So how do you do it? Well the quick way is to just (select all and) copy the content from the existing note into a new note. At this point I’m guessing you’re not exactly bowled over by the simplicity of this technique. However I sometimes have notes that contain a specific title, several tags an author and even a web link – i.e. several items of meta data. These can also be copied and pasted, but I find this a little fiddly. Whilst ENSCRIPT could be used to create a template style import I can’t always rely on having pre-scripted a note I might want to duplicate. The alternate method is to use Evernote’s export and import option. Once imported the note needs to be moved from the import notebook it generates and then that must be deleted. There’s probably not much in it, but I sometimes find the Evernote for Windows 3.1 interface a little lacking in responsiveness when trying to select the meta data items against a note and so the export/import works just that little bit faster. Hopefully a future release (maybe even the 3.5 beta) will include a simple duplicate option (e.g. through copy & paste of an entire note). Since Google Notebook went out of development earlier this year I’ve made the migration over to EverNote. It has many cool features one of the coolest being the ability to upload images and have EverNote run OCR to index the content of the image. 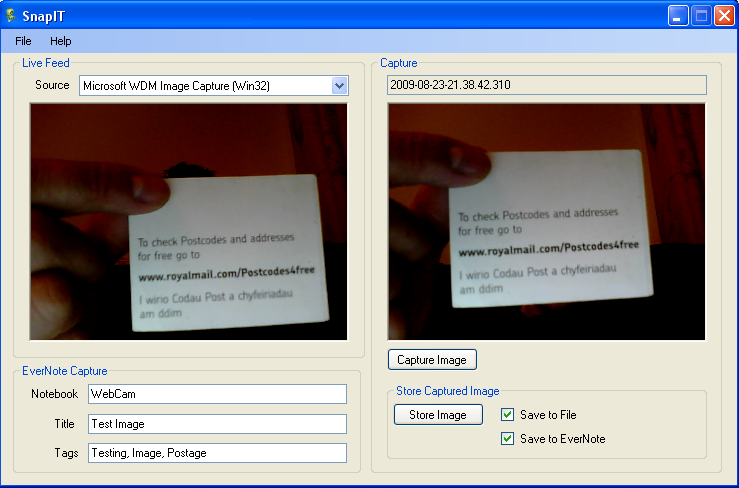 The mobile phone EverNote applications allow a phone’s camera to be used to take a snapshot image and to upload it to EverNote over a 3G connection. Unfortunately the Windows desktop application has no functionality for capturing images in the same way through a web camera and with the proliferation of netbooks I feel that this is a feature that is sadly missing – well for me anyway. So after a bit of research I embarked on a quick weekend VB.Net project to put together a little application that could do this – and so I created SnapIT. SnapIT allows you to take a photo with an attached or built in camera (by pressing the “Capture Image” button) and save it (by pressing the “Store Image” button) to a specified folder as a JPEG with a file name based on the time at which it was taken. It also allows you to send the image off to an EverNote database with options to specify which notebook it gets sent to (it will of course default to the default notebook), a title and tags (separated by commas). Where the image ends up is determined by the checkbox options that have been selected (next to the “Store Image” button). It’s a standalone executable and stores a few settings in an INI file it creates in the same folder. When you first use it (assuming you want to save images or send them to EverNote) you will need to set a few file/folder paths. This can be done from File > Settings. You need to set a folder to store images in, the location of ENScript.exe (used to send the image to the database) and the location of the EverNote database file to which images should be sent. This is just something I threw together for my own use and given that I wrote it in just a day or so it really hasn’t gone through much testing, so please keep that in mind when using it. That being said if you find a bug then add a comment to this blog post and if I can reproduce it I may just find the time to fix it and post a new version.